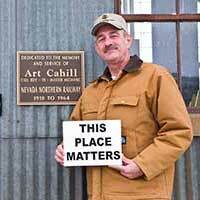 The struggle over pit mining in the Virginia City National Historic Landmark has shifted south through Devil’s Gate from Storey to Lyon County. At last month’s scheduled hearing before the Lyon County Planning Commission, Comstock Mining Inc asked for a continuance, saying it hadn’t had time to prepare. This time company CEO Corrado De Gasperis delivered the applicant’s response to the Planning Commission Staff Report just 30 minutes prior to the meeting, giving no-one any time to prepare a reasoned response. 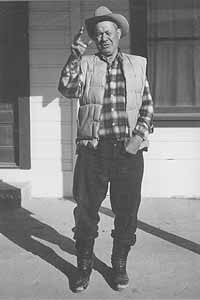 TOM SANDERS did every kind of hard work there was — miner, logger, road builder — He was a tough, hard-working guy and he told the stories that grew out of his tough, hard-working life. More about Tom and his tales if you click “Continue Reading” below. This is his Christmas story, “Jesus’ Birthday”, dated Reno, 1932. Then after ten years I come back and worked on this ranch again and here was this same Jesus. And when he was up in Colorado herding sheep for ten years, he made a lot a money. And one day, when his birthday was gittin’ close, gittin’ close to Christmas Eve, he quit and went to Reno, to a Basko hotel there. 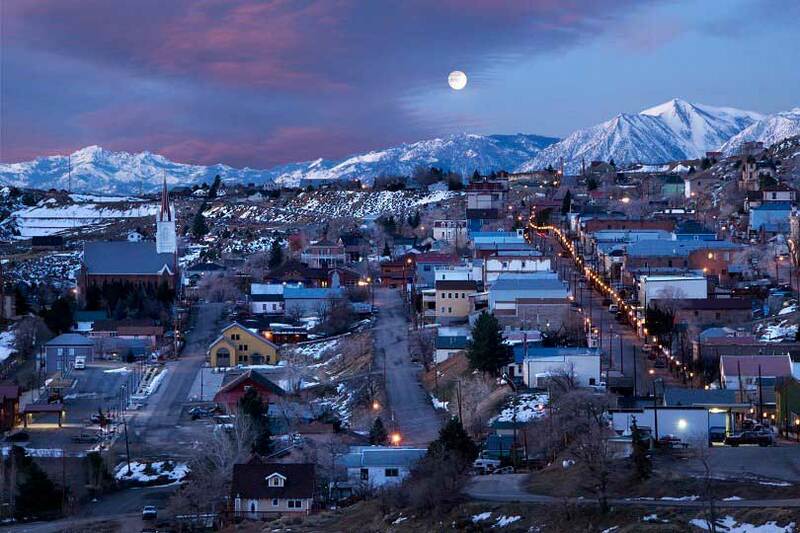 To a resident of Storey County like myself it was a stunning revelation. In Lyon County the commissioners tell the Staff what to do, not the other way around. They ask questions intending to form opinions, and they state opinions openly. Most startling of all: they protect their residents’ rights. Whatever the reason, Mr. De Gasperis was noticibly off his game once again. Where he has so often met setbacks by rushing to spread Harmony, Good Will and Yes-Indeedy, he seemed hesitant, chastened and vague. Besides the bankruptcy of his arguments, Mr. De Gasperis’s remarks emphasized that CMI isn’t really a mining company, it’s a real estate management firm, “one-third owned by Intergroup” he stated, and showed attractive scenes of apartment complexes from that company’s website. The thought that real estate manipulators like John V. Winfield or whoever he sells to might end up owning dense development rights in Silver City cast a further pall over the proceedings. John Marshall, the Comstock Residents Association attorney, spoke to the point that CMI shifted its ground in its new response to the Staff Report. He pointed out that CMI’s abandoning its first argument in favor of this new one was an admission that the staff had it right. WHEEZER DELL: YES OR NO? 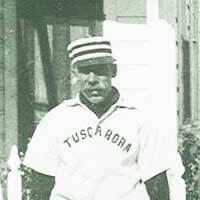 My first casual observation was that the bonafide photo of Wheezer shows him in a uniform and cap consistent with his baseball career’s era of 1912-1920s, whereas the Tucarora team’s attire is certainly from an earlier period (1880s to about 1905). Hence, it seems very unlikely that the fellow with the big moustaches is Wheezer. Moreover, that style of lip whiskerage was antiquated and unfashionable for young men by or before 1915, and it’s unlikely that Wheezer would return to Tuscarora from his days as a big city celebrity and grow a moustache of the kind his father’s generation favored (and contemporary movie stars spurned). He reminded the Commissioners that their predecessors had consistently ruled that open pit mining was an incompatible near neighbor to the quiet town of Silver City. CRA’s presentation also included the video at the top of this page. It’s an excellent production by Silver City residents Bob Elston, Thomas Honesco and Canyon Cassidy. When the video had been shown, the floor was opened to public comment. Speakers on behalf of Silver City wore a distinctive loop of red ribbon pinned to their lapels. Many of the speakers on behalf of the mining company wore new CMI caps and brown shirts. There were so many speakers, in fact, that the meeting was recessed for lunch and Item 1 on the agenda didn’t conclude until after 2 pm with a 5-1 (1 absent) vote against the Master Plan Amendment and unanimous 6-0 against the Zoning change. CMI announced shortly after this meeting that Al Fiegehen, owner of the Dayton Consolidated and 3 additional claims, had exchanged all remaining interest in his property and any claim to future royalties for one million shares of common stock, worth about $1.50/share when the deal was struck. If he is careful about it, and the stock price holds after the Lyon County setback, he will escape with about 1.5 million dollars. CMI now owns outright the properties it deems “the company’s second largest, classified gold and silver resources”, but for the company’s sweet dream of mining there to come true, the Lyon County Commission would have to break all precedent and renounce the Planning Commission’s recommendation to spare Silver City. These questions now go to the Lyon County Commission for decision at its January 2 meeting, with emphatic recommendations for denial from the Silver City Town Board and from the Lyon County Planning Commission. There are five commissioners on the Lyon County Board, and one of them was elected with help from the Intergroup Corporation, the real estate management company that Mr. De Gasperis claims owns a big piece of CMI. John V. Winfield, CMI’s Chairman of the Board, owns a big piece of Intergroup as well. He also controls Santa Fe Financial Corp and Portsmouth Square Inc. Each of those three California corporations contributed $2,500 to one Lyon County Commission candidate at the last election, and CMI contributed $10,000 on top of that for a total of $17,500 from John V. Winfield. An undeveloped stretch of land on Fernley’s Main Street is expected to be transformed into an art park by springtime, thanks to a collaboration between the city of Fernley and the Black Rock Arts Foundation (BRAF), a San Francisco-based non-profit that places art from the Burning Man festival and other works in public places. Officials plan to install three artworks in the park, which does not yet have a name. On the bill are Bottlecap Gazebo, a two-story, lotus-shaped structure made of lumber, steel and about 75,000 flattened bottlecaps, and Rock Spinner, a boulder, situated on a spinning apparatus, that can be spun by passersby. 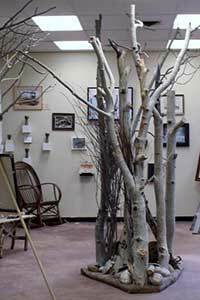 A third piece, to be commissioned specifically for the park, is still under negotiation. The Nevada Department of Transportation donated the stretch of land. The city received a state grant for a revitalization feasibility study. And BRAF contributing to the downtown overhaul with grant funding from the National Endowment for the Arts’ Big Art for Small Towns program. Fernley is a popular stopping point for the thousands of Burners who arrive from points East, and no stranger to Burner culture. Hauenstein says, “Burner tourism has a huge impact on our community. It affects the hotels and restaurants in a major way.” She says the local Walmart sees a major boost in sales during August as Burners stop for camping gear and other supplies. Community approval and support for the park and its artworks has been high, she reports. As an additional nod to Burner-tourist relations, Hauenstein says the city is considering a water supply in the park where Burners would be able to fill their own containers en route to the festival. The festival does not provide amenities such as water, so city officials believe a water spout for filing large containers would be a valuable resource to Burner tourists. The citizen review board reviewed six proposals for the third, commissioned art piece in December. Their recommendations will go to the city council in mid-January, and information about that piece is expected to be released then. This is the first in a four-part series of Nevada Travel Network updates on the development Fernley’s downtown art park. That candidate was elected; his name is Hastings. I’ll be at Yerington on January 2, wearing the red ribbon. You should come too, extra ribbons will be available. and in Las Vegas the Las Vegas Motor Speedway will add to the jolliness overload by keeping its elaborate LED Christmas light display twinkling and blinking through January 5th. It’s $15/car for the awesome drive-through ($13 if you bring s bag of “gently used” clothing to contribute to Goodwill) . . . Nevada will celebrate its 150th birthday in the coming year. We’re on the edge of our seats waiting for the fun to begin, which it does in Fallon with a 5K Fun Run/Walk starting at 10 am on New Year’s Day. Festivities are scheduled all around the state throughout the year, including the ambitious Battle Born Birthday Cake Celebration in March, when a 1300-lb. birthday cake will be served in Carson City. It’s a re-creation of the cake made for the Centennial in 1964 . . . Our correspondent Kris Vagner’s own art team, The Pier Group, is in negotiation with the Terry Lee Wells Nevada Discovery Museum at 490 S. Center Street, downtown Reno, over a plan to install the group’s Ichthyosaur Puppet Project in the museum’s foyer. The Puppet is a 50-foot ichthyosaur skeleton marionette designed by Vagner’s fiance, Jerry Snyder, and made of shaped, laminated plywood. 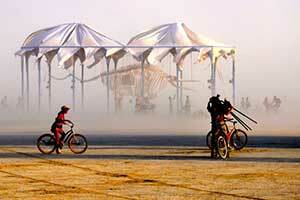 It was installed at Burning Man in 2013; installation at the museum is expected in early spring . . . The moon was full. I hiked up Cedar Hill in the dark with a headlamp, to a place where you can see the peaks around lake Tahoe. I wanted to capture my favorite town in the twilight. I stumbled up the hill following deer and lion tracks to a spot where I waited for the sun. The town was shaded by an eastern knoll, but the dawn began to light the snow covered peaks in the distance, that were still bright from the beautiful moon. Gazing at the past, in the present, a wondrous sight!